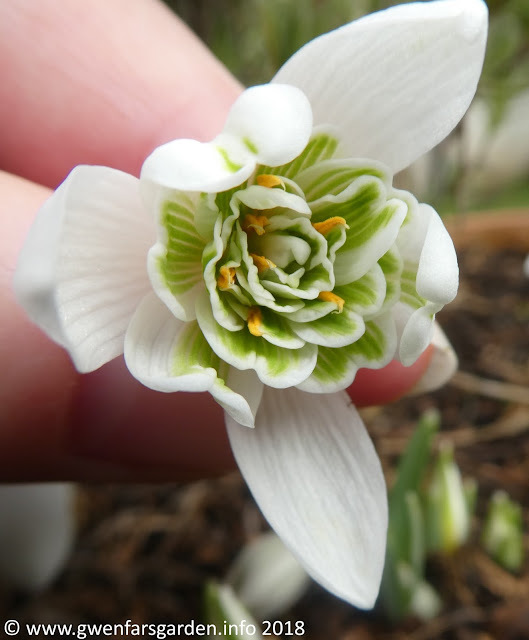 Yes, I know it's still late winter, but look, Spring is on it's way in the garden. 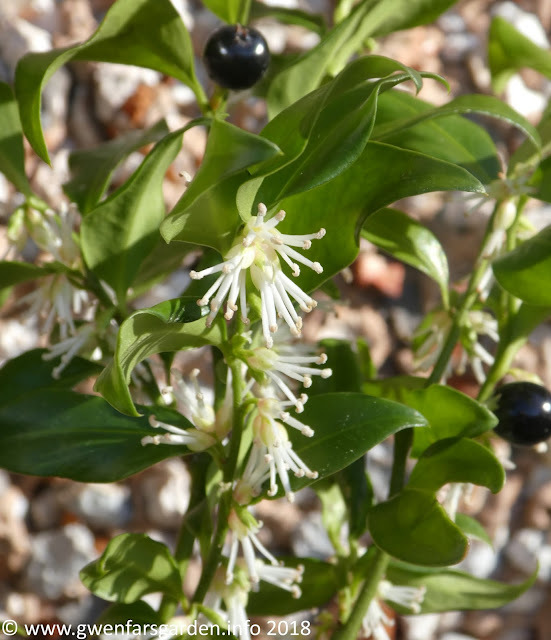 I have the Sarcococca confusa by the front door and the fragrance is divine. 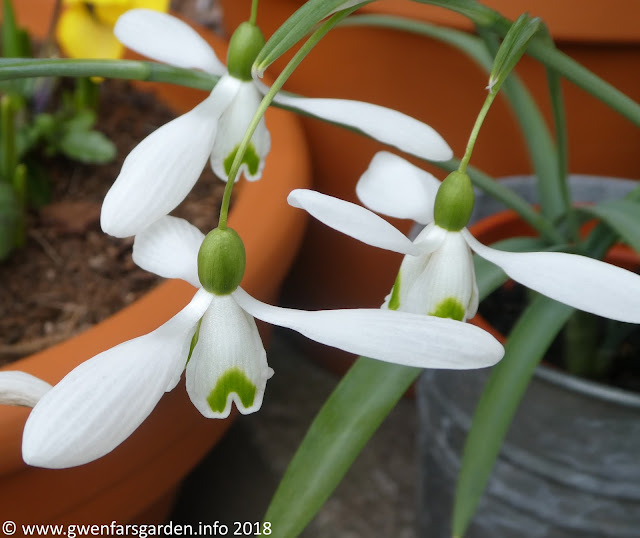 I have a few snowdrops in pots. 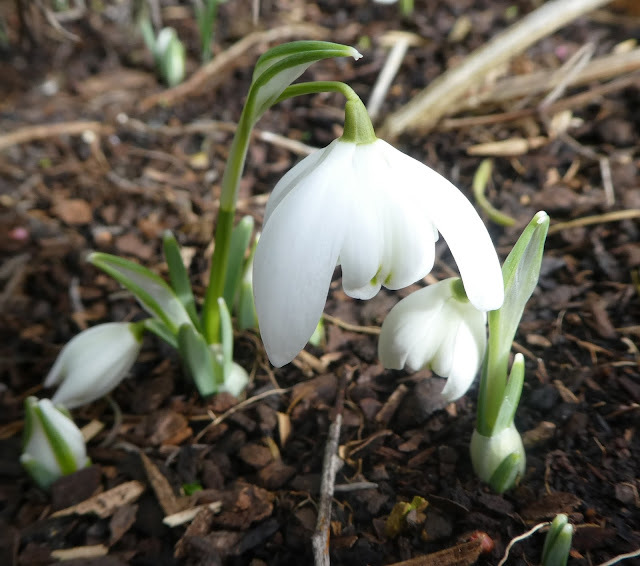 The first here is Galanthus ophelia. This one is special to me as was J-P's, and it was given to me by his wife Kate who felt I'd appreciate it. I so do. Just having something that J-P chose, in my garden, means a lot to me. 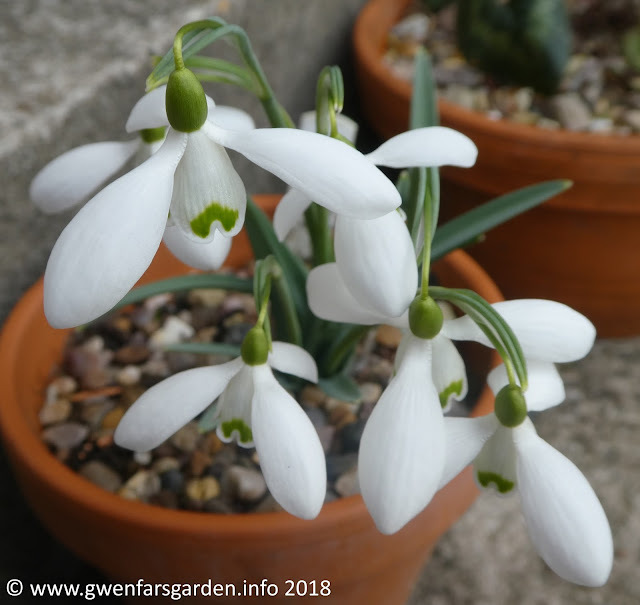 Next up is Galanthus ikariae. 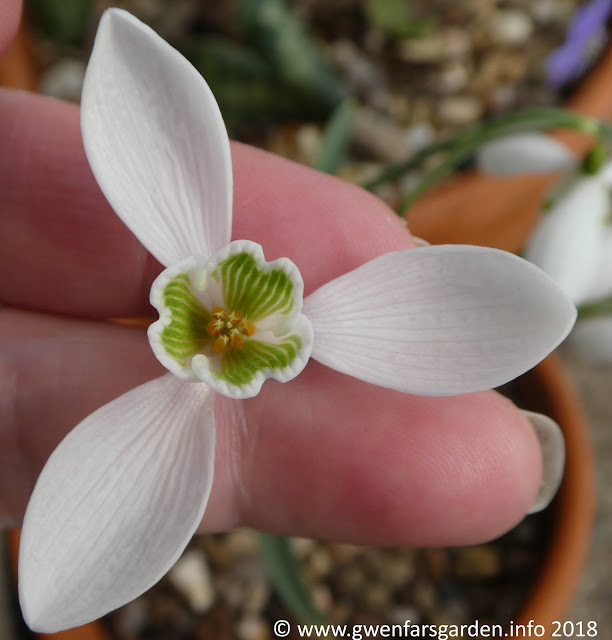 If you are like me, it's hard to tell the difference between a lot of snowdrops. Ophelia and Ikariae looks so similar, so I took photos of the inside to see if there was any difference. The main difference that I can see, is that the inside green markings on Galanthus ikariae are darker and a bit bigger than on Galanthus ophelia. I counted 7 and a bit 'bars' of green on Ophelia, but Ikariae has 8, with 'a bit' extra on each end of the bars. 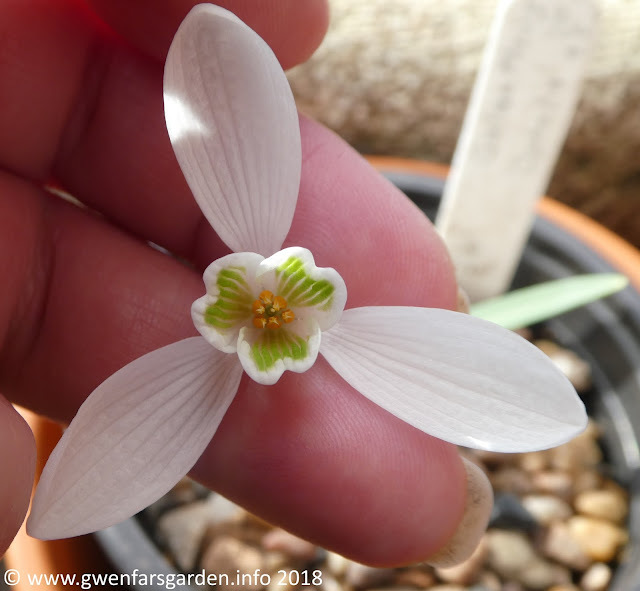 Perhaps a galanthophile could tell me the difference in botanical terms?! Either way, I love both, but especially Ophelia. My other favourite snowdrop is Galanthus nivalis f. pleniflorus 'Bagpuize Virginia', who I've blogged about before. A lovely memory of our previous life in Oxfordshire. 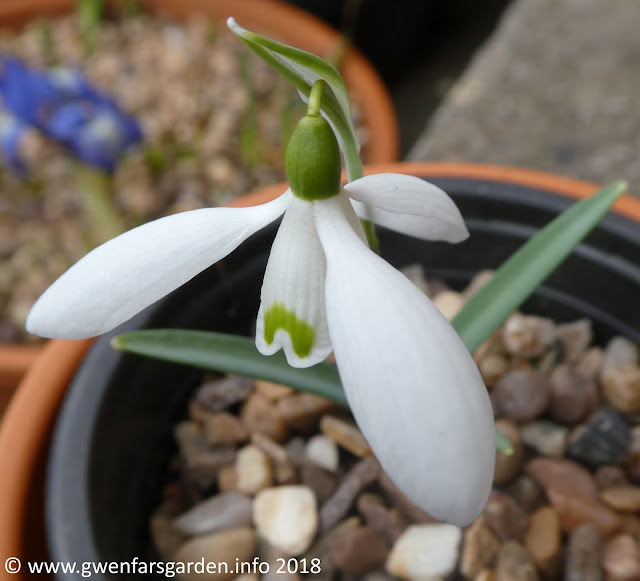 And then there is the unknown galanthus - somehow lost the label. 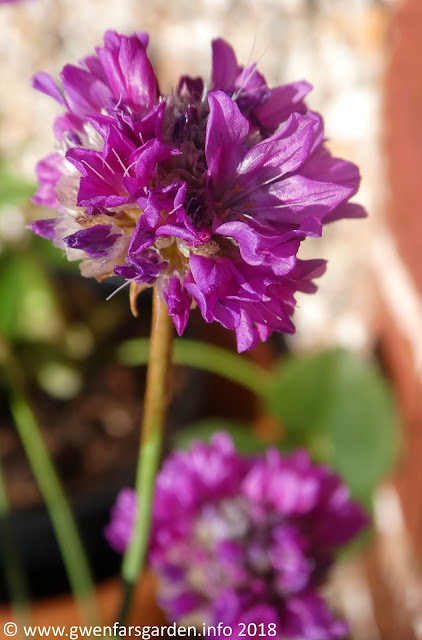 I like the way it's petals look like the wings of a wind turbine. There also a lot of colour. 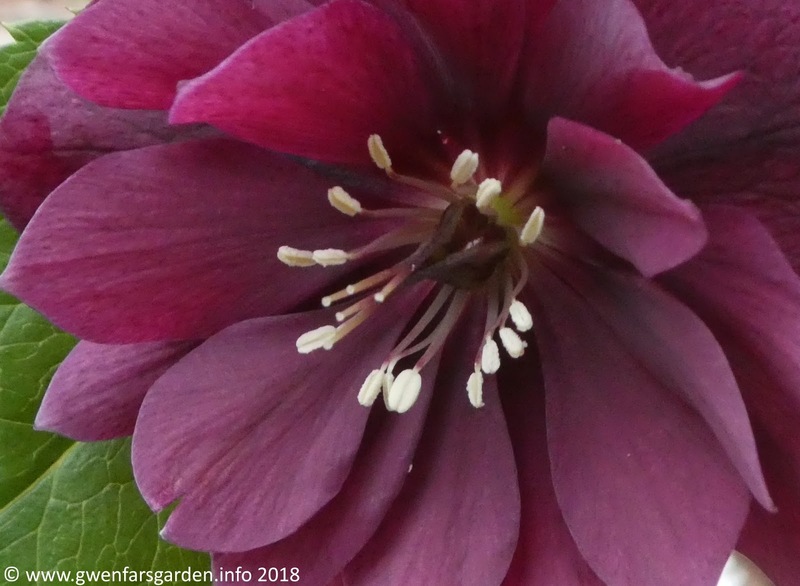 I love the colour and texture of Helleborus x hybridus 'Double Ellen Red'. And was also recently seduced by Helleborus 'Painted Bunting', and added it to my collection. 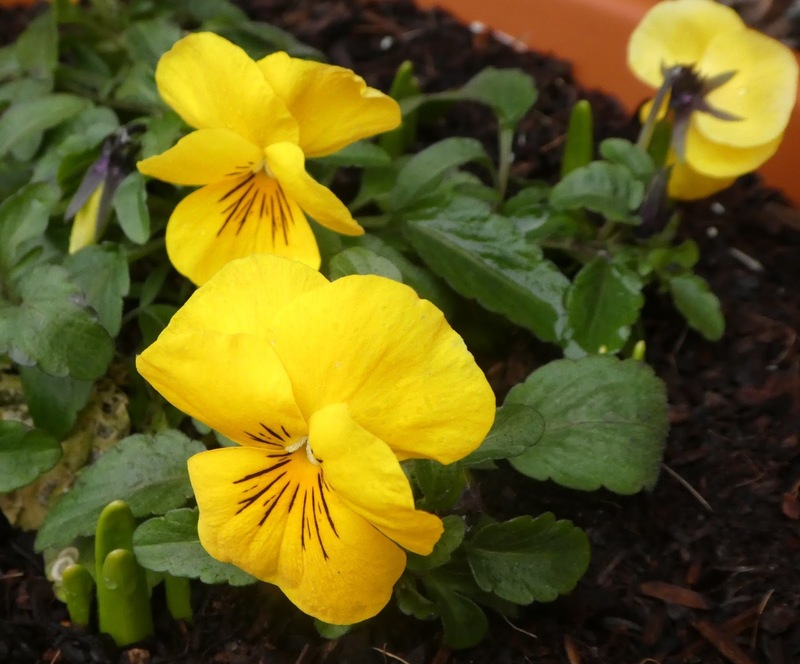 There is the ever cheery yellow viola. 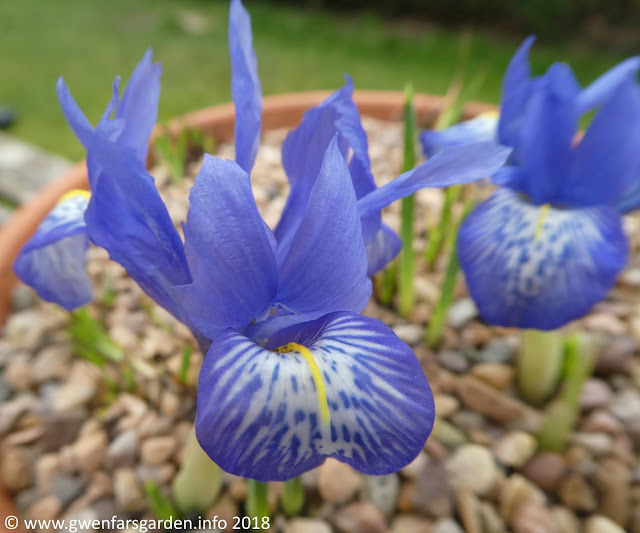 The cool blue of Iris histrioides 'Lady Beatrix Stanley'. The silky blue of Hepatica transsilvanica 'Blue Eyes'. 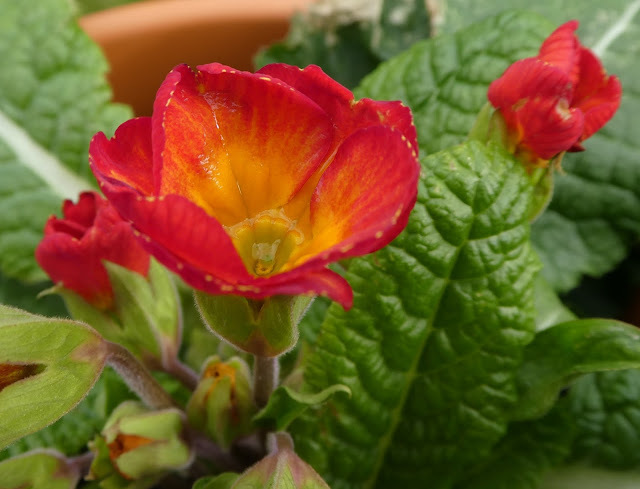 The volcanic red-orange of Primula Ember Glow. 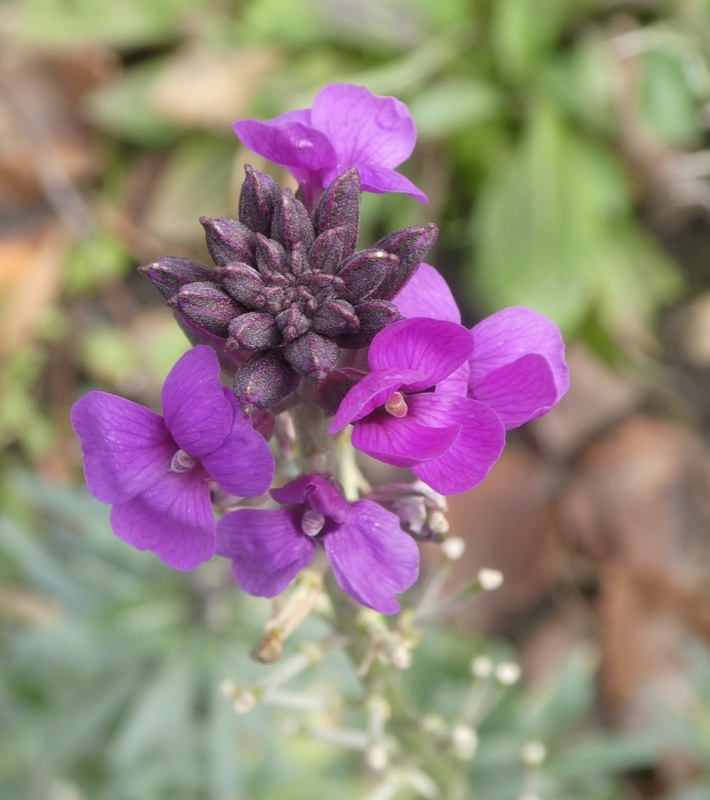 Then the non-stop flowering of Erysimum 'Bowles's Mauve'. 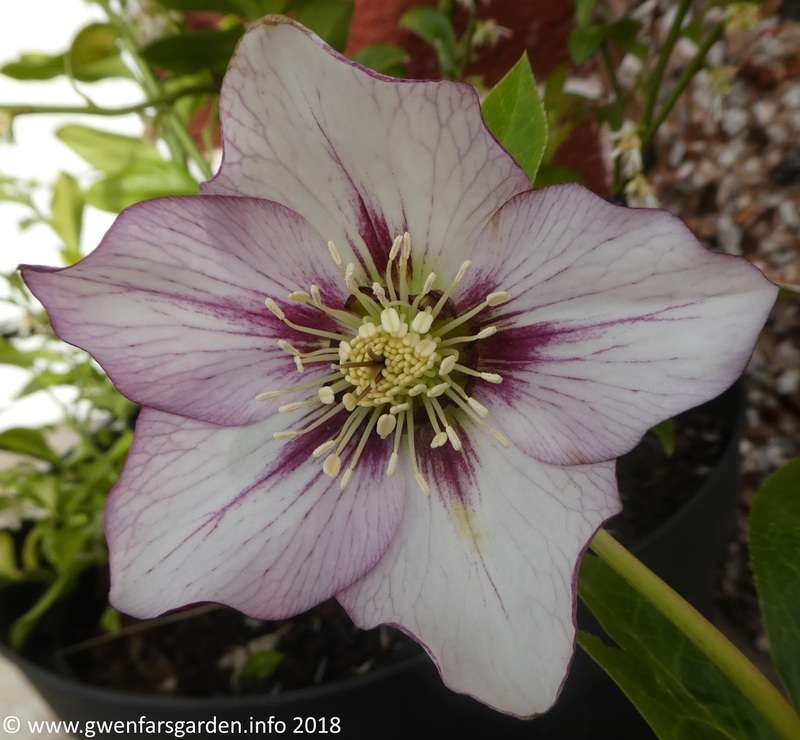 Seriously, this hasn't stopped flowering for months and months. 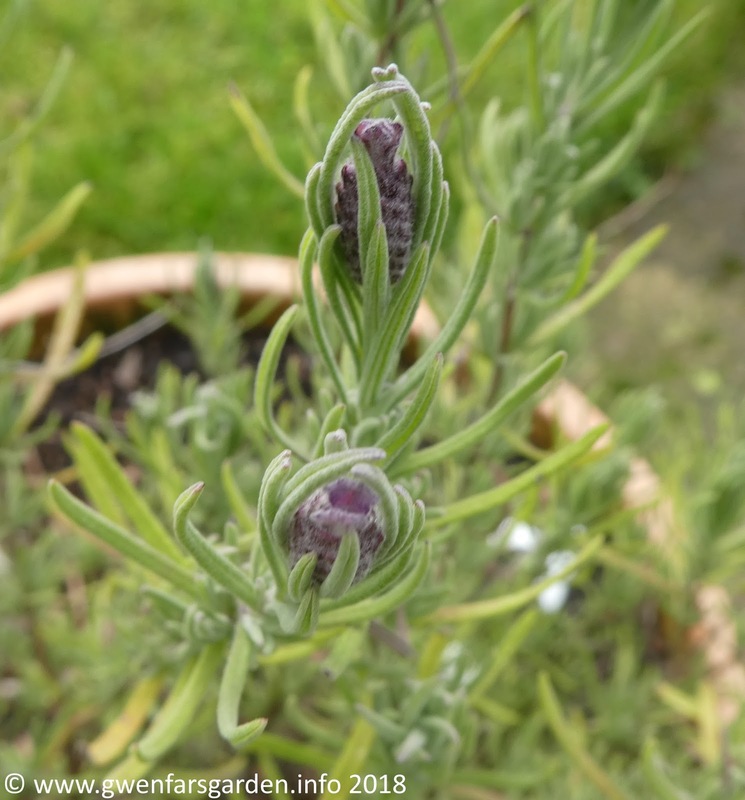 However, someone needs to tell Lavandula 'Regal Splendour' that it isn't supposed to be getting ready to flower for a few months yet. Still, I shan't complain. And while we are at it, this Armeria pseudarmeria 'Ballerina Lilac' has also been flowering all winter. It's by the south-facing front door, which might help. It looks like the weather may get colder again next week. Even some snow is being expected. 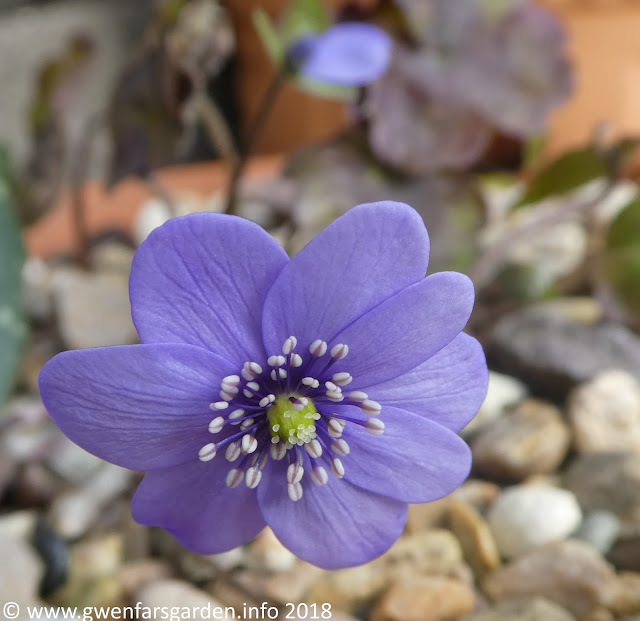 But I don't mind, because the garden is telling me that Spring is coming.